Content overload is here to stay. What’s the state of content marketing today, and what challenges lie ahead? Listening to more than a dozen great speakers at Content Marketing World provides a sense of where our industry’s going. I boiled down 3 days of presentations to 3 graphs that offer insights into the trends that will shape content marketing’s future. 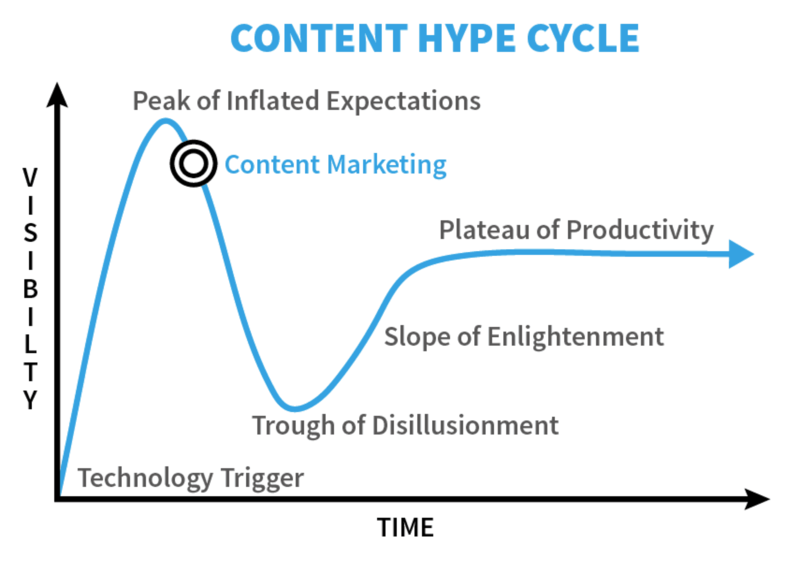 Joe Pulizzi of the Content Marketing Institute showed the classic Gartner hype cycle graph in his opening keynote. He sees the current state of content marketing as being just past the peak of inflated expectations. Inflated expectations for content marketing have peaked. Look out below: here comes the trough of disillusionment. The trough of disillusionment looms ahead. 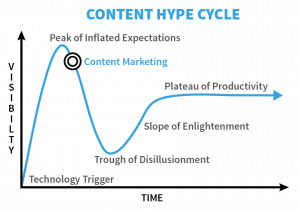 Technology marketers, especially, know exactly how the trough of disappointment feels. Whenever people come to expect too much from a shiny new thing, they get deeply disappointed as it dawns on them that the shiny new thing won’t solve all their problems. Only 35% of B2B marketers and 27% of B2C marketers follow a written content marketing strategy. Only 59% of B2B websites convey a discernable message. Lack of a message is the #1 reason people leave B2B websites. Research and understand buyer personas. Size up competitors’ content and find ways to outflank them. Set and follow a written content marketing strategy that starts with business objectives. Create a clear, compelling, consistent message. Insist on high-quality content that is on message, on strategy and beyond the competition, produced by the best journalists, graphic artists, and writers. Some marketers expected – and perhaps promised – too much from content marketing. In those cases, disillusionment is sure to follow. Keep your eyes on the horizon. After content marketing hits a low point, I expect our industry will wise up about what’s possible. That means we’ll learn enough to maximize the enormous potential of content marketing. 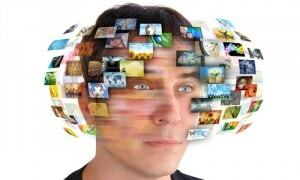 A major challenge we already see is content overload. Andrew Davis shared his graph on information overload. I’ve taken the liberty to change his graph to focus on content overload. Marketers produce more and more content, but the amount of attention customers can pay has maxxed out. Content overload is easy to find. Just look around. 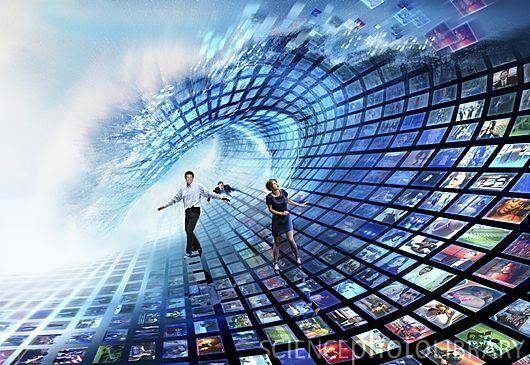 The amount of content available to consume goes up every day. “Today, we see 10,000-plus marketing messages from the time we wake up until our heads hit the pillow,” authors Robert Rose and Carla Johnson note in their new book, Experiences: The 7th Era of Marketing. How’s it feel to see 10,000 or more marketing messages a day? But the amount of time and attention people can pay to content is finite. There are only so many hours in the day to consume content, even if you’re juggling 2 or 3 screens. On top of that, American’s attention spans have shrunk to as little as 8 seconds. Andrew cautions that the actual opportunity to connect with buyers through valuable content is much smaller than the opportunity to connect that some marketers perceive. Are we becoming too obsessed with: How many widgets of content marketing can you produce, how fast? Does content marketing have to turn into a race to the bottom in pursuit of the lowest-cost content? Churning out content like a factory is how some companies try to address the gigantic perceived opportunity. But the actual opportunity to reach consumers with content is much smaller, and to break through the clutter of 10,000 messages demands high-quality content. That’s why I believe that content marketing is fundamentally artisanal and organic, not industrial and mechanical. I often compare great content marketers to great gardeners. 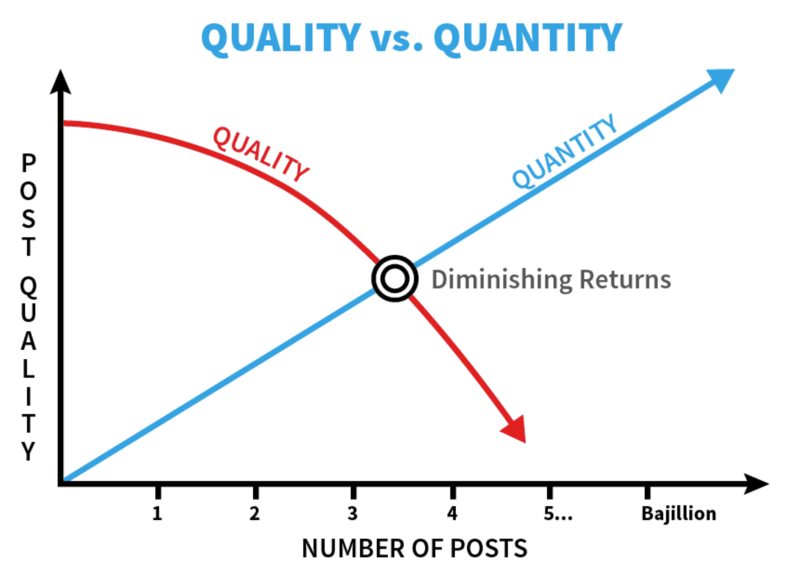 The more content you crank out, the harder it is to maintain quality, as Ann Handley points out in this graph. 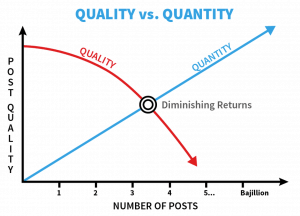 If you keep increasing the number of blogs produced each week, at some point quality is sure to suffer. As quality flags, fewer buyers will read the blogs. It’s a game of diminishing returns. 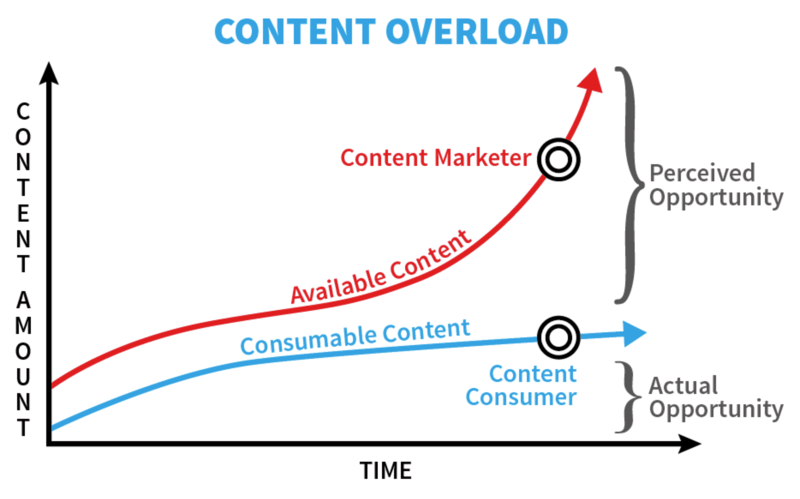 Low-quality content leads to content overload and buyers who tune out. For marketers, tuned-out buyers lead to disillusionment about content marketing. 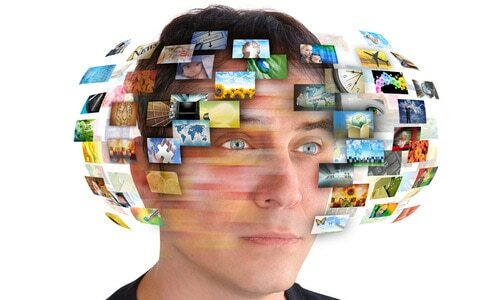 Marketers’ overinflated expectations about content marketing … leading to disillusionment. Readers’ content overload … leading to less marketing content consumed and to higher and higher expectations for content quality. 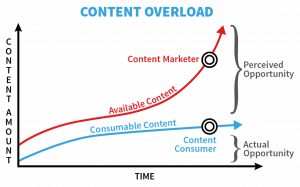 Marketers who produce industrial quantities of content widgets to address the perceived opportunity … leading to an even larger content overload problem, while still missing out on monetizing the actual opportunity. 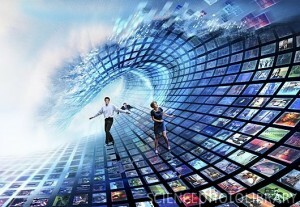 It could be a bumpy road ahead for content marketing. We have enough content. What we really need is quality content that makes customers’ lives better. Quality will trump quantity. Marketers who insist on the very best quality content will get ahead of competitors. As Jay Baer said in his keynote, the world has enough content marketers already. What we really need are marketers who bring genuine passion and authenticity to content marketing. We need marketers who not only make content but also make a difference. I see passionate, purposeful, authentic artisans in the vanguard, leading content marketing forward. I hope you’ll be among them.